The SpeedTech collection is a collaboration between Orient Watch and Subaru STI. 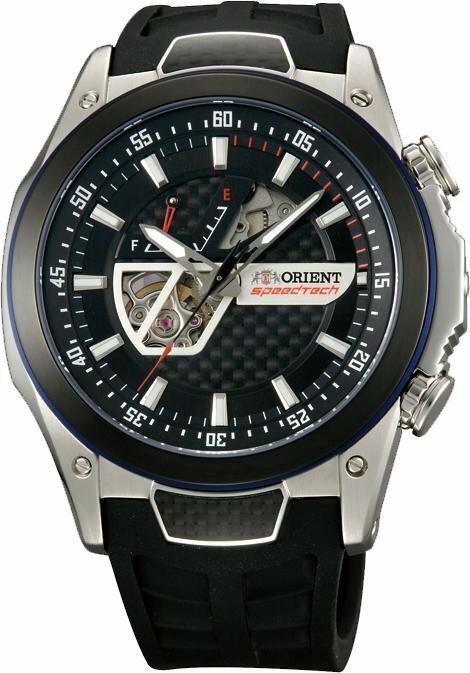 The design of the watch takes the robust movements from Orient Watch and pairs them with a racing design that’s inspired by features of the Subaru STI GT300 car. The New Orient SpeedTech is the latest collaboration between the Subaru Tecnica International Inc. (STI) and Orient Watch. Orient Watch has sponsored STI in the SUPER GT for two consecutive years, specifically the Subaru BRZ GT300. The SpeedTech Auto STI comes in a design similar to the Subaru BRZ GT300, such as the Orient SpeedTech logo plate at the 3-o’clock position (created in the image of STI’s logo plate), and the see-through design at the 9-o’clock position that symbolizes the shape of an air outlet. This is a stylish sport watch with deep racing inspired motifs and specifications such as a semi skeleton dial, carbon fiber accents, exhibition case back, power reserve indicator and sapphire crystal with AR coating.